At the mention of “Hades,” Lily’s eyes grew wide, and Peter’s mouth fell open. Instantly the riverbank filled with creatures. All of them were wraith-like, but none wore hoods like the guide. Instead they looked starved and forlorn, cast in shades of blue and white. Sometimes the most powerful things are the most unassuming,” said Bruce, winking at Peter. Peter tried to smile back, but grimaced instead. 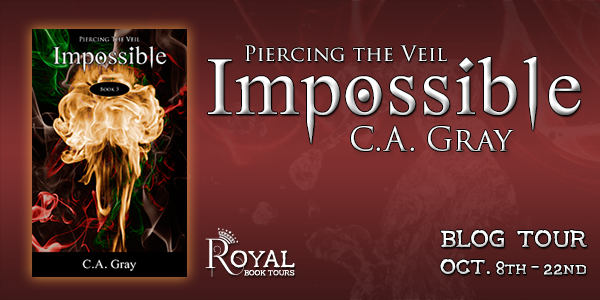 Impossible is C. A. Gray’s final book in the Piercing the Veil trilogy featuring the long awaited battle between the Watchers and the Shadow Lord! Fans of the series have anxiously been looking forward to the conclusion of this finely crafted tale and the revealing of the Child of the Prophecy, Gray definitely DOES NOT disappoint. With the Shadow Lord in possession of fragments of Excalibur and the Philosopher’s Stone, thus granting his army invincibility, the watchers set on a quest to even the playing field before the epic showdown. 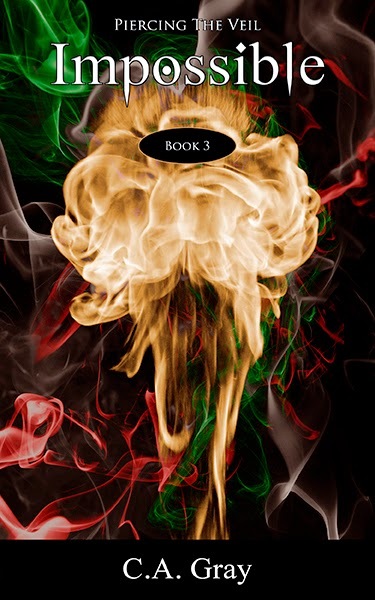 Gray weaves this fantastic conclusion to the story with her unique brand of story telling grabbing the reader in a very believable fantasy world where the characters are balanced with real life problems in their difficult quest. In all honesty I am not typically a fan of the Sci-Fi & Fantasy genre, especially not when geared toward the young adult crowd. Despite this bias, I found Gray’s style of story telling quite refreshing and enjoyable. With the mythology ties and level of detail that was shown in this fantasy world, Gray drove me to keep turning the pages rapidly. Speaking of detail, the author paints a colorful mental image of the fictional world. Gray’s level of detail is astounding at times as she continually builds a backdrop in each scene rivaling that of the more famous fantasy authors. The main characters, Peter and Lily, upon first impression were not very likable with each coming across as slightly annoying. However, by the second half of the book the reader will begin to appreciate the legitimacy of the characters as real people with personality flaws. I attribute this style of character development to the author’s attention to detail in the story; rarely does a fantasy story balance the fiction and realism that Gray has accomplished. Though the target audience for this book is a younger audience, the attention to detail and unique story telling style of the author results in a book that is recommended for readers of any age that enjoy a well written story that draws the reader into an intricately woven fantasy realm. I found the writing style captivating and will definitely be on the look-out for more books by C.A Gray!